Cultivating a Culture of Collaboration and Creativity in the Classroom - This live, online presentation was organized by Apple to introduce their Apple Teacher and Everyone Can Create initiatives for teachers and administrators. I shared my book, Cultivating a Culture of Collaboration and Creativity in the Classroom to highlight how I implement creativity with my own students. Cultivate Critical Thinkers with Code - In this hands-on session, an Apple Distinguished Educator will demonstrate why coding is essential for students to thrive in a future driven by technology. You will experience how she teaches coding and incorporates these concepts into core subject areas to enhance critical thinking and problem-solving. Bring Student Voice to Life with Books on iPad - In this hands-on session, an Apple Distinguished Educator will share how students from primary grades can use new features in Pages on iPad to express themselves through writing, drawing and more. From memoirs to reports, student voice and ideas come to life through the creative process of authoring a book. Classroom or Start-up? Turn Your Classroom into a Design-thinking Hub! Innovative classrooms are like tech start-ups: students brainstorm, develop, test, & market ideas for solutions to problems. Learn how to use technology to incorporate student inquiry, voice & choice, and project-based learning to facilitate a design-thinking based environment; encouraging creativity, collaboration, communication, and critical thinking in your elementary classroom. Everyone Can Code: Inspiring Young Learners with Computer Science - Learn to use the Everyone Can Code curriculum from Apple to introduce coding to your K-5 students. Learn to complete challenges, program simple apps, and code robotics like Sphero and Dash. Presentation will include show how to access and use the Everyone Can Code curriculum and a hands-on component with Tynker and Swift Playgrounds. Voice and Choice: Inspiring a Classroom of Creativity and Collaboration with GAFE- Using G Suite Apps for Education, this session will demonstrate ways to discover students’ passions and facilitate authentic learning opportunities for collaboration, communication, critical thinking, and creativity. Voice and Choice: Creation and Collaboration with GAFE - Using G Suite Apps for Education, this session will demonstrate ways to discover students’ passions and facilitate authentic learning opportunities for collaboration, communication, critical thinking, and creativity. ​Voice and Choice: Establishing a Culture of Creation and Innovation with Tech - ​Using GAFE and Apple apps for iPad like Keynote, Clips, Apple Podcasts, and Garage Band, this session will demonstrate ways to discover students’ passions and facilitate authentic learning opportunities for collaboration, communication, critical thinking, and creativity. Google Educator Level 1 Training: I developed an 8-week online training program for colleagues in my school district. I am an Apple Distinguished Educator, Class of 2017. 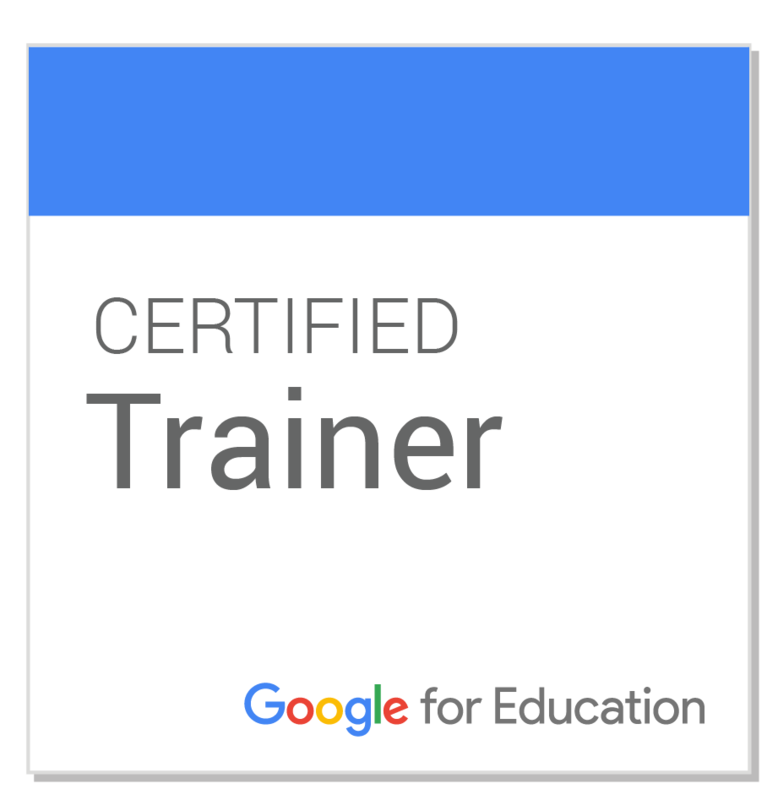 ​I am a Google for Education Certified Trainer. I am an Apple Teacher.